Here’s a question for those of you who engage in some type of social media monitoring for your organization: If something were happening at a physical location, and that something was important to your organization, how would you go about monitoring the social conversation and content coming from that event? You might say that you’d identify words or phrases that you think people might use during the event, perhaps promote a unique hashtag, plug these keywords into your social media monitoring platform of choice, and analyze what you found. While this approach is likely to be successful in uncovering some great content and producing helpful insights, you may run into some unforeseen issues. What if the hashtag didn’t catch on? What if people were using your target keywords but weren’t actually at the event? What if they were posting valuable, actionable content, but didn’t use any relevant keywords at all? Focusing only on keywords and hashtags means you’d be missing out on the full picture of what was actually taking place at that location, and your results would be clouded. Now, imagine searching for that location on a map, drawing a virtual perimeter around your area of interest, and visualizing the content coming only from within those boundaries regardless of what words were used. Location-based social media monitoring platforms like Geofeedia are changing the way organizations look at social media monitoring, and are positioned as complimentary to keyword-focused tools. During the London Olympics back in 2012, we performed an experiment. We were trying to understand just how much of the social media content during this event actually contained relevant keywords or hashtags that might be tracked with a traditional monitoring tool. Without a location-based social media monitoring tool, more than 115,000 social media posts originating directly from Olympic venues would have been difficult to find or lost entirely. How Do These Location-Based Tools Work With Keyword Monitoring Tools? While location-based tools are certainly the best way to visualize what’s happening at a defined physical location, they are not meant to replace keyword-focused tools. Rather, location-based social data sets fill the gaps left when relevant keywords are not used and provide a rich visualization of the real-time happenings during an event. We like to use the statement things happen at a place. While obvious, this statement reflects a fact that has been somewhat ignored by those developing social media monitoring technology… until now. We’ve also heard from a number of our customers that through the insights gained with location-based social monitoring, new words and phrases have been discovered that were not previously included in their set of tracked keywords. For example, we were recently showing Geofeedia’s platform to Wal-Mart and noticed a number of customers within stores referring to the brand as Walzies. The team in the meeting wasn’t aware of that reference until seeing the content coming from directly within the store. There have been other instances of customers posting references to similar brands or stores that were not previously considered in the competitive set. These new brand references and competitor names could then be added to the organization’s set of tracked keywords. As smartphone penetration, the use of location services, and the number of active social media users continue to rise, the value of location will skyrocket. 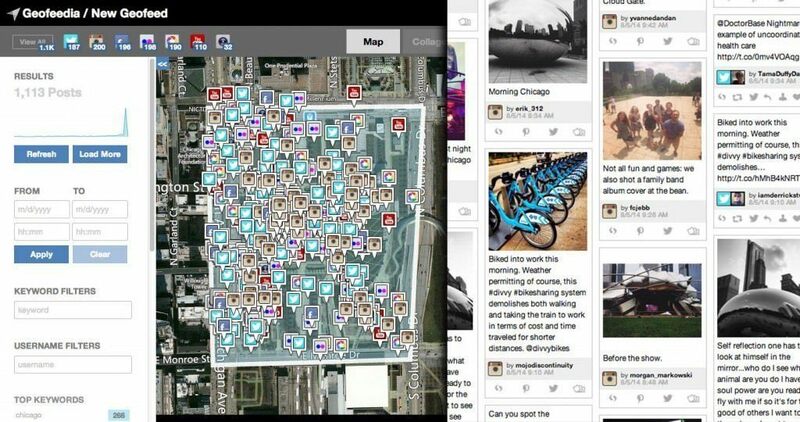 The intelligence gained through hyper-local social media monitoring is invaluable to almost every industry. Government, public safety, private security, media, marketers, retail, hospitality, airports, universities, and many more organizations are beginning to place a huge amount of importance on always knowing what’s happening at their locations of interest, and they’re finding a solution in location-based social media monitoring. A Colorado native, Ben Adelt is currently the Online Marketing Manager at Geofeedia in Chicago, the leading location-based social media monitoring platform. His experience includes developing and executing social and digital strategies, web design and development, mobile marketing and media strategy.